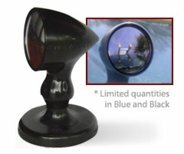 Cargo View Mirror [CargoView Mirror] - $14.95 : NewDaVincis.com!, Great Innovative Products, Gadgets and more. Stop wondering if your precious cargo has fallen off the roof of your vehicle! The CargoView Mirror is an adjustable, magnetic mirror that connects to the hood of an automobile and enables the driver to monitor rooftop cargo. It could alert motorists beforehand if their equipment is in danger of detaching from the vehicle's roof. By simply placing the CargoView Mirror on the hood of the vehicle and adjusting it to make the rooftop freight visible, the driver can keep an eye on cargo such as ladders, kayaks and bicycles. Once in place, the CargoView Mirror remains stabilized and will not slide off the vehicle. A motorist can also attach the CargoView Mirror to the outside of the driver's side door and use as an adjustable spot mirror. This can eliminate blind spots, making it safer for the driver and others vehicles on the road. Ideal for traveling to skiing, kayaking, camping and other outdoor destinations . Pleasant: product's color might be different than the one showing in the picture.